When Nedra Lucas graduated from Northwestern University in 2015, she knew she wanted to work in the public sector, but not necessarily in a public health job, despite her anthropology degree and global health minor. “I wanted to get my bearings about what it meant to work at a nonprofit, whether it was a small nonprofit or a large nonprofit,” said Lucas, who works at Chicago Public Schools. Lucas decided to participate in the NU Public Interest Program fellowship and was offered a job in CPS’s Department of Principal Quality, which identifies, supports and retains principal leaders for district schools. “PIP was really a nice stepping stone to get my foot in the door and to really learn what a nonprofit can look like in a city like Chicago where there’s so many different ways to get involved in the public sector,” she said. In addition to job placement at a community organization working for the public good, NUPIP offers students the opportunity to participate in professional development seminars at nonprofits throughout the city, which Lucas attended regularly. “PIP not only gives you an opportunity to do that and gain hands-on experience, but also to learn about Chicago as an entity and all the different ways that the public sector works.” she said. Through NUPIP, Lucas was matched with a mentor who had a similar background to her interests at Northwestern. Her mentor earned a PhD in anthropology and had experience teaching public heath to high school students. Through meetings with her mentor, Lucas was able to navigate the post-graduation transition and leverage her NUPIP experience for future opportunities. She now mentors this year’s cohort of fellows as one of the “alum chums,” a small group of recent NUPIP alumni who organize social events and provide advice about maximizing the fellowship experience. “It was nice to talk about my experiences through CPS and how they could relate to another job or how I could somehow weave my love of public health into my job here,” she said. 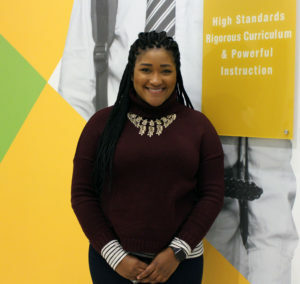 After her NUPIP fellowship, Lucas transitioned into a full-time program coordinator role with her department and is currently helping manage the Chicago Leadership Collaborative, a yearlong internship for aspiring leaders who want to work for CPS. “I really credit PIP with getting the opportunity to work in an organization like CPS,” Lucas said. Lucas said she is still considering a potential Master’s or PhD in anthropology, but she is now looking to combine her recent interest in education with her anthropology and public health background.